"This is going to be a sensational season of television"
Rejoice! Everyone’s favorite equine actor returns next week when Season 5 of the acclaimed animated series Bojack Horseman hits Netflix September 14. Changes abound in the new season including a new hairstyle for Diane. 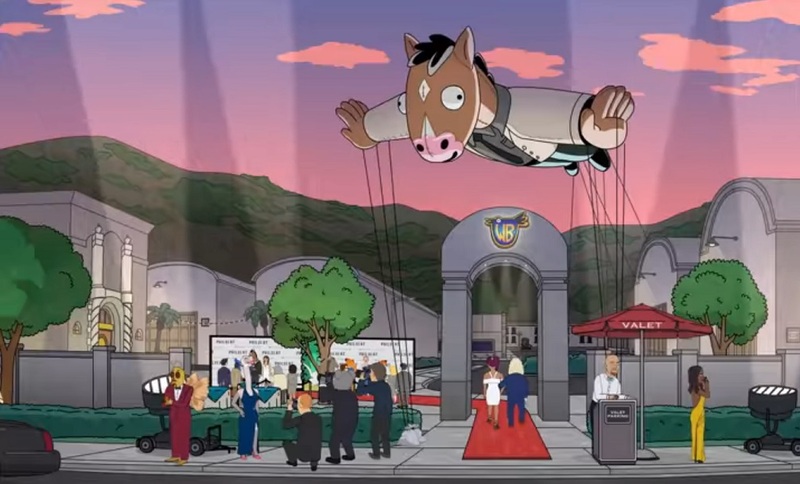 As fans will recall, last season set up some major storylines for Bojack and friends, most notably the production of “Philbert” the show within a show about a detective who gets sent to the future, trapping him in a time he doesn’t understand and where he’s alone – but he’s possibly always been alone. Starring Bojack, “Philbert” looks to be a brilliant send-up on on original streaming shows, in the case of “Philbert” on the website What Time is Right Now.com. In fact, there’s already a real whattimeisrightnow.com website right now promoting “Philbert.” Actor Rami Malek of Mr. Robot fame, and soon to be seen portraying Freddie Mercury in the bio-film Bohemian Rhapsody, voices “Philbert” creator Flip McVicker.